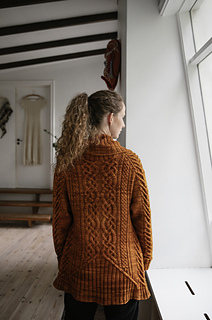 This pattern can be found in issue 6 of Laine Magazine. 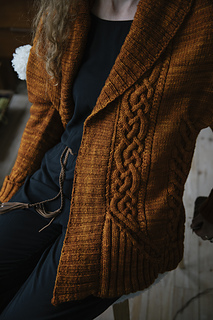 Sode is a saddle shoulder, open front cardigan knitted from the top down in one piece using the contiguous method. 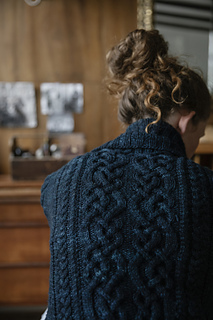 The deep shawl collar is picked up and worked with German short rows after knitting the body. There is minimal finishing, only a bit of sewing after blocking to fix the sides of the pockets to the cardigan. 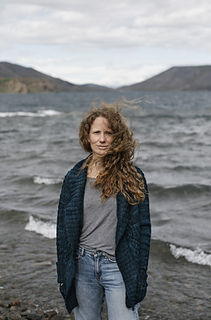 The pockets are knitted at the same time as the body. The cuffs are extra long and worn doubled. 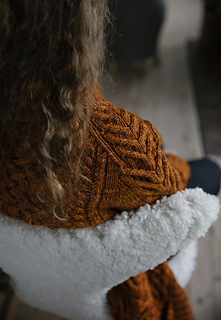 Due to the intricate construction and extensive cabling, this cardigan is best suited for advanced knitters. 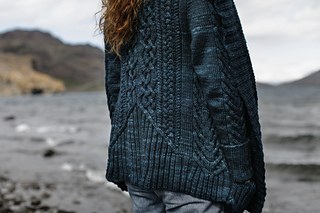 Techniques used include top down contiguous knitting, cabled lifted directional increases, German short rows, and three-needle bind-off. 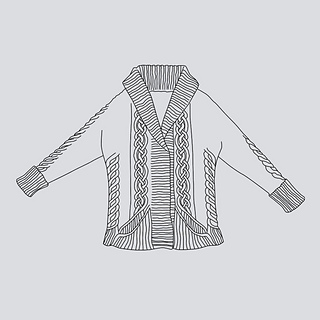 The cables, shoulder, neck and pocket shaping are charted and not fully transcribed. 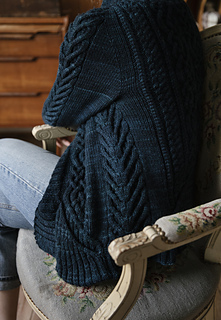 As this cardigan is heavily cabled, knowing how to cable without a cable needle is a distinct advantage. 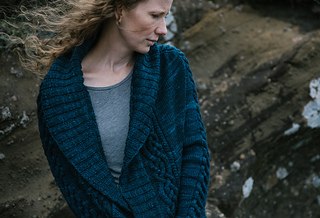 For styling reasons, the cardigan is shown in size XL on a size S model. Recommended ease: approx. 2–4“ / 5–10 cm of positive ease when closed with a 1–4” / 2.5–10 cm overlap of fronts (depending on desired ease). This coat is designed to fit closely to your shoulders with a snug fit through the arms and around the wrists and is meant to be worn open. Thus, the fit across the bust is quite flexible. Choose the size closest to your actual bust, and where your bust is between sizes, size down. The larger sizes are designed to be worn with less ease than the smaller sizes, as the fit is more flattering. An exception to this is if you are a particularly long-waisted medium, you might prefer the length and fit of the size large. Bust circumference: 32 (35, 39, 42, 45, 50, 55, 62)“ / 82 (89, 99, 106.5, 114, 127, 139, 157.5) cm. Body length from back of neck: 23 (23.5, 24, 25, 26, 26, 27.5, 27.5)“ / 58.5 (59.5, 61, 63.5, 66, 66, 70, 70) cm. Upper arm circumference: 12.25 (13, 13.25, 13.75, 14.25, 14.75, 15, 15)“ / 31 (32.5, 33.5, 34, 36, 36.5, 37.5, 37.5) cm. Yarn: 9 (9, 10, 11, 11, 12, 12, 14) skeins of Merino Aran by La Bien Aimée (100% superwash merino wool, 182 yds / 166 m – 100 g), colourway Rust. 1638 (1638, 1820, 2002, 2002, 2184, 2184, 2548) yds / 1494 (1494, 1660, 1826, 1826, 1992, 1992, 2324) m.
Needles: US 7 / 4.5 mm 40” / 100 cm circular needles, US 6 / 4 mm 60” / 150 cm circular needles and a spare US 8 / 5 mm needle for three-needle bind-off. Or needles on which you achieve gauge, and one needle size larger and smaller for the collar, ribbing, and bind-offs. Notions: Cable needle, 12 locking markers, plus 4, different, easily identified locking markers (16 in total), 2 cables or waste yarn for stitch holders and a tapestry needle. 22 sts x 30 rows to 4” / 10 cm on US 7 / 4.5 mm needles in 2x2 ribbing, after blocking. 24 sts x 26 rows to 4” / 10 cm on US 7 / 4.5 mm needles in shoulder cable pattern, after blocking. There are video tutorials available here.